Background: Dengue virus is a leading cause of illness and death in the tropics and subtropics. As many as 400 million people are infected yearly. Dengue is caused by any one of four related viruses transmitted by mosquitoes. Currently, there is no vaccine to prevent infection with dengue virus and the most effective protective measures are those that avoid mosquito bites. When infected, early recognition and prompt supportive treatment can substantially lower the risk of medical complications and death. Nowadays, the search for natural plant products to fight against viral diseases has been increasing. Aims and Objective: To test the anti-dengu viral activity of both ethanolic & aqueous extract of Andrographis paniculata. Materials and Methods: In vitro antiviral activity were performed against dengue virus by the 3-(4, 5-dimethylthiazol-2-yl)-2,5-diphenyltetrazolium bromide (MTT) method and SYBR green quantitative real-time polymerase chain reaction (PCR) method. Cytotoxicity was also evaluated by MTT. The dengue viral load (VL) inhibition in plant extracts was characterized by reverse transcription PCR (RT-PCR) analysis. Results and Discussion: In this study, the maximum nontoxic dose (MNTD) of A. paniculata plant was determined by testing the ethanolic extracts against Vero cells in vitro. Antiviral assay based on cytopathic effects denoted by degree of inhibition upon treating DENV 1–4-infected Vero cells with MNTD of A. paniculata has the most antiviral inhibitory effects. These results were further verified with an in vitro inhibition assay using MTT and RT-PCR, in which 55%–97% of cell viability were recorded in DENV-1–4-infected cells in different duration. Conclusion: Ethanolic extracts treated with dengue VLs also showed a significant changes which were reflected in RT PCR assay. Dengue infection has been documented from India for a long while; an instance of dengue hemorrhagic fever (DHF) was first reported in 1963 from Kolkata city. Since then several outbreaks of dengue fever (DF) were reported from India with a major epidemic of DHF that occurred in Delhi in 1996 when 10,252 cases and 423 deaths were reported. During this epidemic, the proportion of DHF to DF was very high. Out of 35 States/Union territories in the country, 29 have reported cases and deaths due to dengue. It was mainly due to dengue serotype 2 viruses. Following this, in the postepidemic period, 1997, dengue 1 virus activity was seen in Delhi. In New Delhi, outbreaks of DF were reported in 1967, 1970, 1982, 1996, 2003, and 2006. The number of DF/DHF cases and deaths reported since the epidemic has been low till 2002 but again it was raised in 2003. The first evidence of DF in the country was documented from Vellore district, Tamil Nadu, in 1956. In South India, particularly in Tamil Nadu, DF and DHF have been well documented. In Tamil Nadu, DF cases have been reported from 29 districts out of 30, between 1998 and 2005 which include DF/DHF outbreaks. Although uncomplicated DF was prevalent among children and adults in Chennai, DHF has been largely restricted to infants and children but since 2005, DHF among young as well as elderly adults in Chennai has been recorded. During July 2007, DF suspected cases were reported from two rural areas/hamlets, namely, O. Alankulam, P. Alankulam near Madurai Corporations, Madurai and Tamil Nadu. Of the 200 cases, 39.5% were positive for dengue Immunoglobulin M (IgM) and IgG antibodies and 32% for DENV IgM antibodies only. By clinical evaluation, DF was diagnosed in 43 patients, 18 had DHF manifestations and 4 patients had developed dengue shock syndrome (DSS). However, DSS and DHF were present in 22 patients, all of them recovered well. The present study is aimed to screen and determine the anti-dengue viral activity of both ethanolic and aqueous extracts of Andrographis paniculata which have been used as traditional medicine for dengue. A. paniculata plants were collected from Chennai, Tamil Nadu. The botanical identification of plant was determined from local Ayurvedic clinic doctor and the plants were washed and allowed to air drying at room temperature for 1 week. The leaf of A. paniculata was unglued and used. After drying, 100 g of the plant materials were grinded to powder and extracted consecutively with 500 ml of absolute ethanol (Hayman, UK) and aqueous for 3 to 4 days in dark condition. The final suspension was filtered and freeze-dried by lyophilizer (Esquire Biotech, India). A stock solution was prepared by dissolving of 2 g of extract in 100 ml of dimethyl sulfoxide (DMSO) (Sigma-Aldrich, USA) and aqueous solution, respectively. The both stock solution were sterilized by filtering through 0.20 μm filter (Minis-art) and further diluted with minimum essential medium (MEM) to the desired concentration for the assays. Powdered MEM (GIBCO, UK) was used in this entire study. A total of 3.7 g of sodium bicarbonate (NaHCO3) was added, dissolved with 1 lt. of double distilled water and the pH was adjusted to 7.0. Then, the medium was filter sterilized using 0.22 μm polyethersulfone membrane filter (Corning® Sigma-Aldrich USA) under vacuum condition. Vero cells were obtained from the National Institute of Virology. Vero is a continuous kidney cell line isolated from African green monkey tissue. 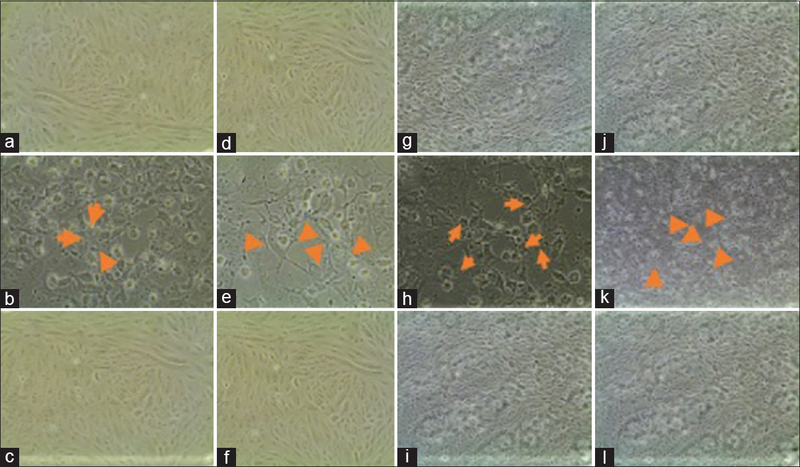 Vero cells were maintained in MEM medium (Life Technologies, USA) containing 10% fetal calf serum (FCS) at 37°C and were used for the propagation of the four serotypes of dengue strains (DENV1, DENV2, DENV3, and DEN4 (611319, 633798, 23085 and 23086). DENV stocks were grown in vero cells. To generate stocks, seed virus was added to 80%–100% confluent cells at a multiplicity of infection in MEM media. After 7 days, dengue virus cause a cytopathic effect (CPE) in vero cell culture monolayers which were documented for evidence of CPE and media was harvested from cells and clarified by centrifugation at 14,000 rpm for 30 min. The supernatant was added with 20% FCS and stored at −80°C. To study the antiviral activity of a plant extracts, it is important to determine whether antiviral activity can be uncoupled from the confounding effect to cellular toxicity. Cytotoxicity tests define the upper limit extract concentration, which can be used in subsequent antiviral studies. Vero cells of concentration 1 lakh cells/well were seeded in 96-well microtiter plates and incubated for 48 h at 36°C in 5% CO2 environment. The growth medium is decanted and medium (W/O FCS) containing increasing concentration of the extracts (100–1000 μg) was added in tetrads. Cell control containing extract free medium and neat extract controls were included. The plates were incubated at 37°C in 5% CO2 environment, 3rd, 5th and 7th day reading was noted microscopically for cytotoxicity [Figure 1]a, [Figure 1]b, [Figure 1]c, [Figure 1]d. Microscopic reading was confirmed by 3-(4,5-dimethylthiazol-2-yl)-2,5-diphenyltetrazolium bromide (MTT) assay. About 1.8 ml of MEM without FCS was taken in 9 sterile tubes labeled from 10–1 to 10–9. About 200 μl of the dengue virus pool was added to the first tube (10–1 dilution) using sterile pipette and mixed thoroughly. Nearly 200 μl from 10 to 1 dilution was added to the next tube and mixed. The dilution continued until 200 μl from 10 to 8 was added to 10–9. 100 μl from each dilution were added in row 10 wells of A to H labeled from −1 to −8. Five wells each of 11th and 12th rows were used as cell control, to which 100 μl of MEM without FCS was added. 100 μl of vero cell suspension (105 cells/ml) was added to all the wells. The plates were incubated at 37°C in an incubator maintaining 5% CO2 environment. The plates were observed on day 3, 5 and 7 CPE was recorded [Figure 2]a, [Figure 2]b, [Figure 2]c, [Figure 2]d, [Figure 2]e, [Figure 2]f, [Figure 2]g, [Figure 2]h, [Figure 2]i, [Figure 2]j, [Figure 2]k, [Figure 2]l and TCID50 was estimated by Karber's formula. The test was performed in tetrads. Cell control, virus control and plant extract control were incubated. Concentration of extracts used: From the stock (10 mg/10 ml) varying concentration of nontoxic dose of the drug were prepared in MEM without FCS and filtered. Virus concentration used: 1, 10, and 100 TCID50 of dengue 1–4 virus pool were prepared in MEM without FCS based on the initial TCID50 of the virus pool. The antiviral assay was performed with nontoxic doses of the extract by direct preinfection incubation assay or viral inactivation assay (Tang LI, et al., 2012) viral adsorption assay and pretreatment assay. The test was repeated thrice at different periods for reproducibility, before use of the extracts in the drug assay. [Table 1] shows primer sequence and size of product for pan-dengue used for this study. The viral RNA was extracted and purified from virus control and different TCID50 of sample well using a mini-viral RNA extraction kit method (Qiagen, Germany), following the manufacturer's instructions. cDNA was synthesized using Superscript-III (Invitrogen, USA) and the prepared samples were optimized in real-time SYBR green quantitative reverse transcription polymerase chain reaction (PCR) with standardized cyclic conditions; initial denaturation at 95°C for 2 min, denaturation at 95°C for 30 s, 61°C for 1 min annealing conditions, 72°C for 1 min of extension, and dissociation stage like 95°C for 15 s, 60°C for 1 min, and 95°C for 15 s for 30 cycles. The cyclic conditions were started to run in the applied biosystems 7500 fast Dx. Subsequently, a melting curve program was applied with continuous fluorescence measurement. Data are expressed as means and standard deviations. All statistical analyses were done by Student's t-test and P < 0.05 was considered statistically significant. [Figure 1] shows the evaluation of the toxicity of ethanol and solubilizing agent used in the present study. The results revealed that distilled water, 70% ethanol and 0.25% DMSO were nontoxic to vero cell line after 7 days of observation [Figure 2]. The ethanolic extracts of the plant at a concentration above 500 μg were toxic to vero cells. The vero cells grown in the tissue culture flasks with MEM supplemented with 10% FCS would form a monolayer sheet of cells. The morphology of vero cells were clearly visualized using an inverted light microscope. Under 40× magnification, the uninfected vero cells were polygonal in shape with well-defined, black nuclei in the center [Figure 2]. Apart from the uninfected cells, the dengue-infected vero cells were also observed under inverted microscope. The various CPEs after 7 days of post-infection were examined at 40× magnifications. From the observation, it was clearly shown that dengue-infected cells showed CPE and the structural changes of the vero cell due to viral infection. The percentage of inhibition on dengue by the medicinal plants, A. paniculata extracts showed the antiviral inhibitory effects, that was 75% of inhibition [Figure 1]. The ethanolic extract of A. paniculata was able to maintain most of the normal vero cell morphologies without causing more CPE. The monolayer sheet of cells still remained normal with less amount of cells death and low percentage of CPE [Figure 3]. 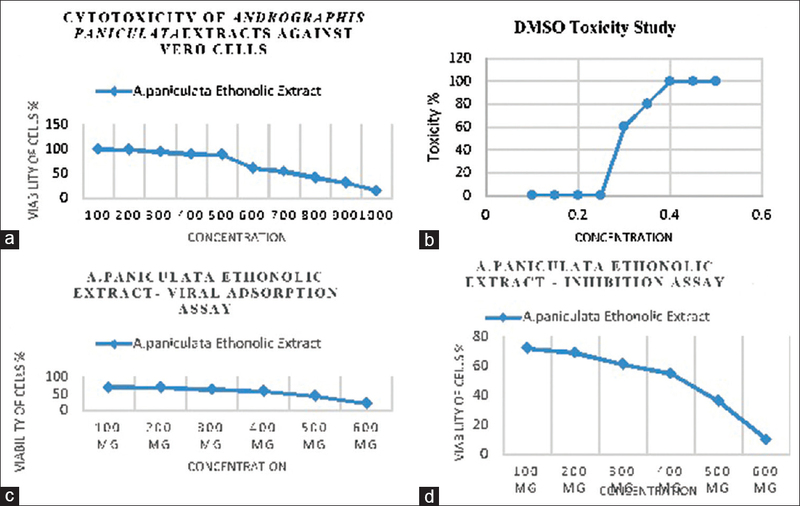 The effectiveness of these extracts in inhibiting replication of dengue virus was further confirmed by MTT assay, whereby the viability of cells treated with A. paniculata extracts was not significantly affected upon infection with dengue [Figure 3]. These findings, based on CPE and MTT assay could be because these extracts were able to inhibit the cell death without inhibiting the virus replication in vero cells. In this preliminary screening study for anti-dengue agent, ethanolic extract of A. paniculata was found to have high potential to be an anti-dengue agent. A. paniculata extract showed a total 75% of inhibition. Viral load (VL) was measured in standard dengue virus 1–4 by real-time quantitative PCR. Mean VL was 4.6 × 102 [Figure 4]. Dengue 1 virus sample had 5.6 × 102 copies/ml, dengue 2 virus sample had 4.8 × 102 copies/ml, dengue 3 virus-infected cell culture sample had 5.5 × 102 copies/ml, and dengue 4 virus-infected patient serum sample had 5.3 × 102 copies/ml [Figure 4]. These results were compared with healthy control and represented in fold changes. A large number of medicinal plants reported in traditional Indian system of medicine – Siddha and Ayurveda have been employed for centuries to treat infectious diseases. The herbs A. paniculata is among few of them which have been used as herbal formulations to treat dengue viral infection. Although they are claimed to be useful in treating infectious diseases, little scientific evidence is available to substantiate the claim. Ethanolic extracts of A. paniculata herbs were evaluated in vitro for antiviral activity against dengue 1–4 viruses. The ethanolic extracts of the herbs exhibited toxicity at varying concentrations. The concentration ≤500 μg ethanolic extracts of A. paniculata were nontoxic to vero cell line. The nontoxic concentrations of the extracts were used for the antiviral screening. In the herbs screened for the antiviral activity against dengue viruses, minimum of 100 μg/ml of aqueous and ethanolic extracts of A. paniculata had antiviral activity against dengue viruses. There are very few in vitro and in vivo studies done with herbs against dengue viruses. The medicinal plant A. paniculata showed 75% of dengue viral inhibition and thus mode of inhibition properties should be further studied extensively. Purification and characterization of the active compounds in order to discover the potential anti-dengue viral compounds should be carried out. Furthermore, investigations to explore the mode of action of anti-dengue activities by the active compounds can be done. Dutta AK, Biswas A, Baruah K, Dhariwal AC. National guidelines for diagnosis and management of dengue fever/dengue haemorrhagic fever and dengue shock syndrome. J Ind Med Assoc2011;109:30-35. Bharaj P, Chahar HS, Pandey A, Diddi K, Dar L, Guleria R, et al. Concurrent infections by all four dengue virus serotypes during an outbreak of dengue in 2006 in Delhi, India. Bio Med Virol J 2008;5:1. Bhaskar ME, Moorthy S, Kumar NS, Arthur P. Dengue haemorrhagic fever among adults – An observational study in Chennai, South India. Indian J Med Res 2010;132:738-40. Victor TJ, Malathi M, Asokan R, Padmanaban P. Laboratory-based dengue fever surveillance in Tamil Nadu, India. Indian J Med Res 2007;126:112-5. Paramasivan R, Dhananjeyan KJ, Leo SV, Muniaraj M, Thenmozhi V, Rajendran R, et al. Dengue fever caused by dengue virus serotype-3 (subtype-III) in a rural area of Madurai district, Tamil Nadu. Indian J Med Res 2010;132:339-42. Bhuvaneswari CK, Raja RS, Arunagiri K, Mohana S, Sathiyamurthy K, Krishnasamy K, et al. Dengue epidemiology in Thanjavur and Trichy district, Tamilnadu – Jan 2011-Dec 2011. Indian J Med Sci 2011;65:260-7. Tang LI, Ling AP, Koh RY, Chye SM, Voon KG. Screening of anti-dengue activity in methanolic extracts of medicinal plants. BMC Complement Altern Med 2012;12:3. Dargan DJ. Investigation of the anti-HSV activity of candidate antiviral agents. Methods Mol Med 1998;10:387-405. Premanathan M, Kathiresan K, Chandra K, Bajpai SK. In vitro anti-vaccinia virus activity of some marine plants. Indian J Med Res 1994;99:236-8. Weber ND, Andersen DO, North JA, Murray BK, Lawson LD, Hughes BG, et al. In vitro virucidal effects of Allium sativum (garlic) extract and compounds. Planta Med 1992;58:417-23. Chao WW, Lin BF. Isolation and identification of bioactive compounds in Andrographis paniculata (Chuanxinlian). Chin Med 2010;5:17. Kaul TN, Middleton E Jr., Ogra PL. Antiviral effect of flavonoids on human viruses. J Med Virol 1985;15:71-9. Chang RS, Ding L, Chen GQ, Pan QC, Zhao ZL, Smith KM, et al. Dehydroandrographolide succinic acid monoester as an inhibitor against the human immunodeficiency virus. Proc Soc Exp Biol Med 1991;197:59-66. Ono K, Nakane H. Mechanisms of inhibition of various cellular DNA and RNA polymerases by several flavonoids. J Biochem 1990;108:609-13. Reddy VL, Reddy SM, Ravikanth V, Krishnaiah P, Goud TV, Rao TP, et al. Anew bis-andrographolide ether from Andrographis paniculata nees and evaluation of anti-HIV activity. Nat Prod Res 2005;19:223-30. Kumar RA, Sridevi K, Kumar NV, Nanduri S, Rajagopal S. Anticancer and immunostimulatory compounds from Andrographis paniculata. J Ethnopharmacol 2004;92:291-5.